OUR CUSTOMERS WANT YOUR STUFF! Make some CASH off your clothes! OUR CUSTOMERS WANT YOUR STUFF! 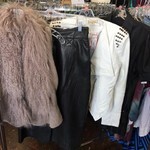 Wildest Dreams is now accepting SPRING Items for Consignment! Here is our 2017 Spring Wish List. Come in soon and check out our newest arrivals, make your appointment to consign by calling 661-324-6484. Or Take advantage of Drop and Go on Tuesdays and Thursdays if you are a current consignor. Bring us your current on-trend items within 18 months new. We want your name brands and your super unique. We will LOVE your quality wearable vintage and well-loved pieces as well. Here is what we want! DESIGNER LABELS XXL TOTES, MICRO-MINI CROSS BODY BAGS, ANYTHING PINK!, PLATFORMS, FLATFORMS, BOOTS, BAD GIRL STYLE, BOHEMIAN, MILITARY, FLORAL, ROMANTIC, RUFFLES, CULOTTES,VINTAGE,STREETWEAR, ATHELTIC WEAR, 80S GLAM, TRENDING DENIM, DESIGNER LABEL JEANS, QUALITY VINTAGE, GARDEN PARTY,STRIPES GALORE, NEON, EMBELLISHED EVERYTHING, FUNKY, UNIQUE, NAME BRAND EVERYTHING.